Winds of up to 94mph have brought chaos to parts of Wales, leaving properties damaged and trees torn down. Aberystwyth in Ceredigion bore the brunt, with reports of a small tornado sweeping across the area. Trees and roof tiles were blown into roads, with several being forced to close but Dyfed-Powys Police said no injuries had been reported. BBC Weather said there had been "a few small tornadoes" across parts of Wales and the Midlands. The RNLI station in Aberystwyth recorded the strongest gust of 94mph shortly after 10:30 GMT. About 600 households were without power for part of the day due to the weather. Scottish Power said service had been restored to about 35 customers in Pwllheli after a thunderstorm knocked out their power. Western Power said most of its customers have also had their power restored but it was still dealing with six incidents across south and west Wales, affecting 308 customers. Thomas Scarrott, director of the Clarach Bay Holiday Village, near Aberystwyth, said 15 to 20 caravans were upended and overturned by what he described as a tornado. Others had their roofs ripped off. BBC News. 2016. 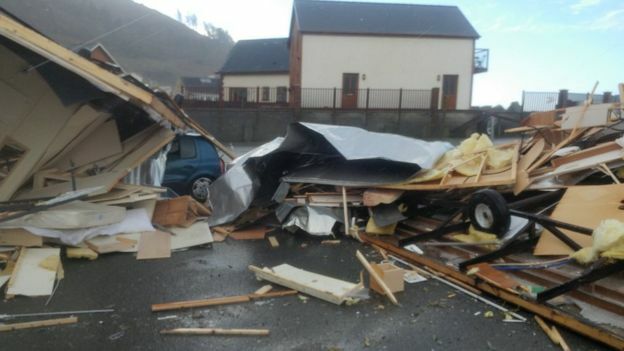 Roofs ripped off as storms hit parts of mid and west Wales. [ONLINE] Available at: http://www.bbc.co.uk/news/uk-wales-38014691. [Accessed 17 November 2016].